The Actron air conditioning system is an excellent piece of equipment, but like many systems, its performance can always be improved. We only use our air con for certain portions of the year, and when they are not needed, it’s the perfect time to improve their performance. This could be a much needed repair or service, but there are other areas that could benefit from some attention. This is quite a common problem in older homes or those fitted with older doors and windows. Even modern homes could have air leaks from tiny holes located around doors and windows. These leaks allow treated air to escape and decrease the level of efficiency of your system. This will lead to higher energy bills and a loss in cooling when the weather gets hotter. A professional local air conditioning specialist will be able to carry out an energy audit and identify any air leaks in your home. The off season is the perfect time to address any performance issues that you may have noticed with your air conditioning system. Perhaps, you’ve noticed an increase in your energy bill, strange noise or a lack of cooling? All of these problems, raise your energy bill and cause a loss of performance. Get in touch with a local specialist; they will be able to get your system ready for the next cooling season. The latest thermostats on the market are packed with features that would have seemed like science fiction only a few years ago. Using a smartphone app, you can communicate with your system remotely via WiFi and have instant control. An advanced digital thermostat has a lot of programmability, but it cannot compare with the immediacy of using a smart thermostat. It’s vitally important to have regular annual maintenance for your air conditioning system. In fact, twice per year prior to the main heating and cooling seasons is even better. This will reduce the chances of a system failure, increase efficiency and it might even extend the lifespan of your equipment. Speak to your local air conditioning specialist about organising a regular maintenance schedule for the year. If they’re interested in Actron air conditioning, Perth residents and property managers should contact us. At Gas & Air, we supply and install a wide selection of heating and cooling equipment for domestic and commercial properties. 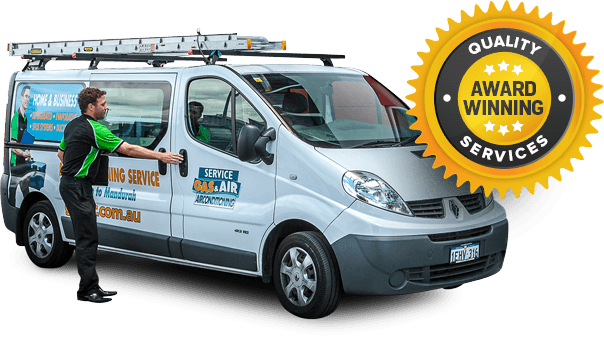 Our highly trained technicians can even carry out an Actron air conditioning service to ensure that your equipment is working efficiently. Our sales team is standing by to discuss your needs in greater detail and to answer any other questions you may have.